Gator Board is our best option. Burlington Camera recommends mounting any print larger than 12x18 to prevent rippling and slouching. It is stronger and more rigid than foam core mounting yet very similar in weight and price. If you prefer not to frame your photographs, we offer custom plaque mounting. Our plaques have hand-painted, coloured edges that will not flake over time and are UV protected. Most mounting options include a non-glare, UV coat and in many cases this will eliminate the need for glass altogether. 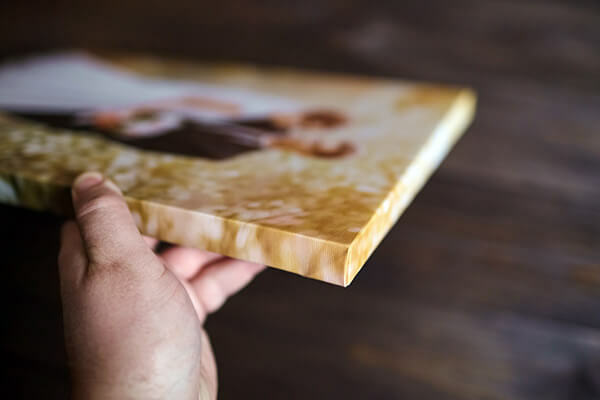 The least expensive option to permanently protect your image or other printed keepsake is to encapsulate it in a 5 mil glossy or matte laminate. This permanently seals the print in a stiff plastic coating that will protect your treasure for many years. We can provide quick in-house laminating services up to 12x18 and 1 week turn around for larger items.